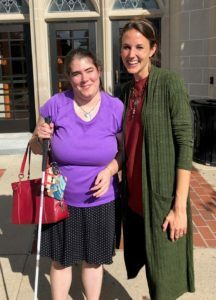 On October 10, 2018 Miranda Oakley joined my English Composition class, the theme of which is diversity and power, at Providence College to talk about her experiences as a blind person in relation to ableism, education, and writing. She is a writer, political activist, speaker and contributor to a growing discourse on social justice and disabilities. Her genres of writing include the essay and memoir. Miranda was a student in my World Literature course at a Rhode Island university. She is now continuing to work on her memoir and recently had her chapter entitled “Abilities before Disabilities: My Educational Journey” accepted for publication to an edited collection on social justice. Miranda volunteers for the campaign of Hélène Vincent, who is running for Boston City Council. She maintains an active presence in social media and on MirandaLeeOakley.com where she posts about being a freelance writer, community events, and her projects in progress. She engages with issues related to blindness, ableism, and treating all people with respect. Miranda is a former student and contributor writer for the well-known New England school, Perkins School for the Blind. Delivered on February 17, 2016 at the University of Rhode Island, this presentation is the result of winning the URI Center for the Humanities Graduate Research Grant. I used the funding to study architecture and archives at the University of Mississippi and in the town of Oxford in July of 2015. 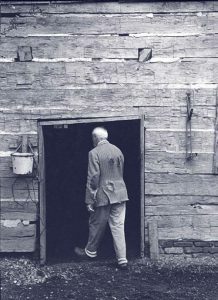 In my talk, I explore how William Faulkner’s novel proposes an architectural and choreographic phenomenology that dramatizes and rehearses our lived experiences with doorways. Faulkner emblematizes the motion of the body in relation to an enveloping built world, challenging the aesthetic boundaries of architecture contemporary to his writing. In the spirit of Maurice Merleau-Ponty and against architectural theory, Faulkner writes a phenomenological world of his own. Also for Introduction to Literary Studies at Bryant University, this class time was mostly devoted to a “close reading” of Eliot’s modern love epic. I begin by making connections between the text and our first day of class, in which we discussed some essential conventions of literature as described by Jonathon Culler. I point out Culler’s notion of literary self-reflexivity in relation to Eliot’s study of Dante and his beginning “Prufrock” with an epigraph from The Divine Comedy. Together, we apply one method of the interpretation to the first stanza of the poem, for which I write guiding questions on the board. We used this method twice before in class. I ask students to consider key words from the passage and any pattern or relationship that might be established among them; they should think about the tone or mood suggested by these words; they should pick out any significant imagery, etc. ; finally, students should determine how they believe the passage fits in with the whole text, how it distinguishes itself and relates to the rest. After we examine the first stanza together, I put the students into groups and assign various stanzas to each. In the following class, each group chooses a partner to write their collective notes on the board while another member explains their process. My goal was for students to critically interpret and vocalize those interpretations several times as a way of trying out their perspectives while having them challenged.